UBC is committed to creating an exceptional learning environment and takes the role of teaching in the creation of that environment very seriously. Peer and student evaluations of teaching inform the tenure and promotion decisions at the university. CTLT offers a variety of professional development opportunities throughout the academic year and over the summer to support faculty on their career pathway. A number of orientation resources are available to faculty who are new to the campus. CTLT partners with UBC HR to offer a full day of programming for new faculty and staff at the start of each academic year. Faculty new to UBC will have an opportunity to network with peers and be will be introduced to the wealth of departments and resources available to support their teaching careers. For their first year at UBC, CTLT stays connected to each new faculty cohort through regular email communications, newsletters, workshops and networking sessions. Faculty Relations provides a number of resources for faculty members new to UBC, including benefits enrolment, payroll, and house and relocation services. UBC’s HR website offers a rich orientation guide for faculty and staff new to UBC. UBC is committed to creating an exceptional learning environment and takes the role of teaching in the creation of that environment very seriously. Peer and student evaluations of teaching inform the tenure and promotion decisions at the university. CTLT offers a variety of professional development opportunities throughout the academic year and over the summer to support faculty on their career pathway. These opportunities are facilitated within programs and services that enable faculty members to engage at the individual, group and community level. One of the ways to keep track of your career progression at UBC is to develop and maintain an up-to-date teaching dossier, as outlined in your appointment letter. 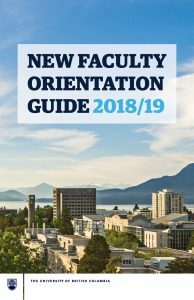 A first step to connecting to the wealth of resources available to new faculty (including other faculty!) at UBC is to attend the New Faculty and Staff Orientation prior to the start of the academic year. This day-long event is co-organized by CTLT and UBC’s central HR unit and is typically scheduled the last week of August or first week of September each year. The TDP for New Faculty will help participants build a foundation for their teaching careers by providing a network of support around teaching and learning. The pilot program launches in August 2019. It is recommended that faculty keep an up-to-date record of their teaching and service activities at the university. Resources and one-on-one support are available at CTLT. A central resource where faculty and staff can explore the learning technology tools available to them at UBC—for use in traditional classrooms, blended courses, and fully online learning. Register for CTLT’s professional development programs at events.ctlt.ubc.ca. Learn about fundamental teaching and learning issues to help you through your first term. This 3-day Instructional Skills Workshop (ISW) is designed to enhance the teaching effectiveness of both new and experienced educators. The Classroom Climate Series is a year-long program where faculty, teaching assistants, researchers, graduate students, and staff from all over the University have the opportunity to challenge their own assumptions about what they have learned about Aboriginal people, become more critically aware of their teaching and research practices, and learn more about how they engage with topics that challenge their own social location within the institution. The Peer Review Program coordinated by the Centre for Teaching, Learning and Technology offers you the chance to participate in a cross-faculty formative peer review of teaching process. The formative program is open to anyone at UBC. Twice a year, CTLT offers a workshop on the peer review of teaching. Customized workshops and consultations are available for individual departments, schools, and Faculties are available upon request. UBC’s Instructor Network: Connect with experienced faculty and receive updates on topics related to teaching and career path from this UBC instructor-led network. Dialogues: Stay up-to-date with the latest news in the UBC teaching and learning community. Events Newsletter: A monthly announcement of all upcoming events hosted by CTLT. Edubytes: A monthly newsletter featuring articles on emerging trends in higher education. Teaching & Learning Resources Portal: bibliographies and guides on a variety of teaching topics. LT Hub: this site recommends effective tools for different learning technology uses, provides guidance on using the supported educational tools (including Connect), explains how to contact support groups, and shares project updates and governing decisions related to teaching with technology.